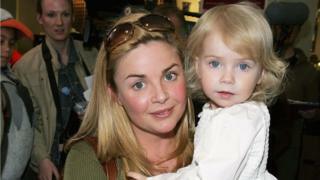 TV presenter Gail Porter admits it was her toddler daughter's reaction which helped her accept her baldness.The Scottish personality stunned friends and fans two weeks ago when she revealed she would start to wear a wig after 14 years hair-free.The alopecia sufferer says she has been a poster girl for the condition, shunning wigs and promoting the choice to be seen without hair.Despite deciding to give hair a go again with a natural wig, she says her 15-year-old daughter Honey still prefers her bald look. Gail will wear her wig "as a luxury"
Speaking to BBC Radio Scotland's Mornings with Michelle McManus, Gail said: "I had the chance to have a real hair wig made just for me and just thought I would like to wear something, I thought I might wear it maybe if I go out on a date, but not all the time. "When I wore it for the first time, it was a little bit weird. I flicked my hair and it was nice to look a little bit different. But it was odd that people reacted to me as if I was a different person - usually I flick my hair and I don't have any hair and I just look like I have a kind of tick! "Gail wanted to show women like her that it is fine to be bald, but that a wig is an option. And she tried her look out on daughter Honey, 15. She said: "When I had the wig on she was like 'Yes, I like it" but when I took it off she said she liked that better. She has grown up with it and has never really known me with hair. When I take it off, she says "Yes, there's my mum." Gail's hair fell out suddenly at the height of her TV presenting career in 2005. She described the moment her alopecia manifested itself, saying: "My hair started falling out when Honey was about a year and a half. I looked it up and read that lots of women who just had a baby could lose patches of hair. "Soon after, I was working in America and I was having a shower and the water was round my feet and it was just all full of hair. I looked in the mirror and literally half my hair had just come out for no reason. "I was freaked out thinking 'How am I going to film and look the same as I looked yesterday"I went to America, left my daughter with my ex-husband and came back completely bald." Gail was concerned about her daughter's reaction. "It was the one thing that worried me - how my daughter was going to deal with mummy coming home with no hair. "I went away with long blonde hair and I came home with nothing. So I had to call my ex-husband and tell him. "But when I got there she was so tiny and she just looked at me and said "rock and roll" and that was it. "So I just didn't care what anyone else thought. And since then, for her, it's normal and I think without her positivity, I don't know where I would have been. "I just thought there are so many worse things in the world. I've lost my hair, but my daughter loves me, end of story." Gail says she is constantly described as "brave" but says she is no such thing. She says being brave is doing something amazing and that she is just not wearing hair.Her alopecia came at a time when her mother was battling cancer.Sandra Porter eventually died from breast cancer in 2009.Gail told Michelle McManus: "When it happened to me, my mum had cancer and she lost her hair and that put things in perspective. "It wasn't even a thing to care about. I didn't care what I looked like. "I just think there are so many people out there going through hair loss for horrendous reasons. "So if people are losing their hair for those reasons, I would like to be the person they come to and say: 'If you can do it, I can do it'."